Off the Beaten Path spotlights over 1,000 of the United States' most overlooked must- see destinations. Plan an unforgettable vacation with this best-selling travel book-a super-easy reference that shows you where to go, how to get there, and what you need to know before you begin your adventure. The best-selling Reader's Digest travel book has 40% new content including over 200 new sites, over 200 new full-color photographs, and all-new, up-to- date maps. 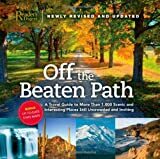 Off the Beaten Path spotlights over 1,000 of the United States' most overlooked must- see destinations. In a state-by-state A-to-Z format, this budget-friendly vacation planner reveals the best-kept secret spots so that no matter where you live, you can plan an unforgettable local vacation within an hour or two of your home. Each of the featured sites has been verified by the respective state's tourist bureau as still being "off the beaten path." Revel in nature, science, art, and culture, and encounter the unexpected as you explore undiscovered gems. Packed with innovative ideas for fun day trips and truly memorable vacations for travelers of every temperament, penchant, and budget, this unparalleled escape book leads you to New Hampshire's castle in the clouds. pontoon boating through the Florida Everglades, dinosaurs trails through Colorado, an authentic jousting tournament in Virginia, or a stroll down America's oldest street in New York City. Plan an unforgettable vacation with this best-selling travel book-a super-easy reference that shows you where to go, how to get there, and what you need to know before you begin your adventure. Written by locals, Fodor’s Essential Ireland is the perfect guidebook for those looking for insider tips to make the most out their visit to Dublin and Ireland. Complete with detailed maps and concise descriptions, this travel guide will help you plan your trip with ease. Join Fodor’s in exploring one of the most exciting countries in Europe. Ireland may be a small island, but it’s packed with things to do and see and simply overflowing with natural beauty, vibrant culture, and ancient history. From the splendor of its Georgian homes and Norman castles to its strikingly scenic landscapes, lush green fields, and postcard-perfect villages, there’s majesty at every turn here. Add a lively pub culture, a thriving arts and music scene, a reverence for the spoken word, and a warm and welcoming people, and you see why the Emerald Isle is one of Europe's most popular destinations. •UP-TO-DATE COVERAGE: Fully updated coverage of neighborhoods, must-see attractions, hotels, restaurants, nightlife, shopping, and more. New restaurants and hotels throughout Ireland showcase the best options at different price points and categories. Updated annually to ensure the best and most relevant content. •ULTIMATE EXPERIENCES GUIDE: A brief introduction and spectacular color photos capture the ultimate experiences and attractions throughout Ireland. •PULLOUT MAP AND MORE DETAILED MAPS: 50 detailed maps and a handy country-wide PULLOUT MAP that also covers the city of Dublin to help you plan and get around stress-free. •GORGEOUS PHOTOS AND ILLUSTRATED FEATURES: In-depth illustrated features cover Dublin's literary heritage, iconic sights like the Ring of Kerry and the Rock of Cashel, and the Anglo-Irish Georgian House. Other features shine a spotlight on cruising on the Shannon, hiking in the West, and Irish whiskeys. •ITINERARIES AND TOP RECOMMENDATIONS: Check out the Great Itineraries section to help plan your time, whether it’s a few days or a few weeks. Find suggested excursions from Dublin, a tour of Northern Ireland, as well as the Wild Atlantic Way coastal route. Includes tips on where to eat, stay, and shop as well as information about nightlife, sports, and the outdoors. Fodor's Choice designates our best picks in every category. •INDISPENSABLE TRIP-PLANNING TOOLS: Planners gives useful, practical overviews of important travel information. A Calendar of Events helps visitors choose the best time to plan a visit around special festivals, parades, and golf tournaments. •COVERS: Dublin, Clare, Galway, Cork, Belfast, the Aran Islands, the Ring of Kerry, Connemara, and much more. Planning on visiting the United Kingdom, too? Check out Fodor’s Essential England, Fodor’s London 2018, Fodor's Essential Great Britain, and Fodor’s Scotland.